She kept it traditional and glamorous. 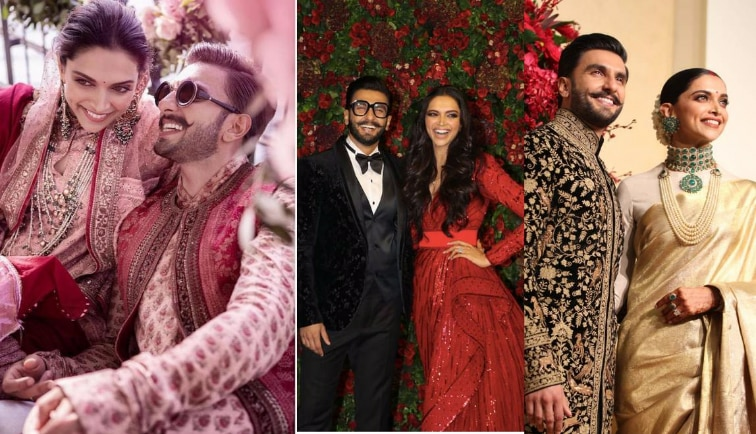 Deepika Padukone and Ranveer Singh’s wedding festivities spanned across three cities- Lake Como, Bangalore and Mumbai and had a string of events. Here is a breakdown of all the looks Deepika spotted for different functions and multiple airport sightings. 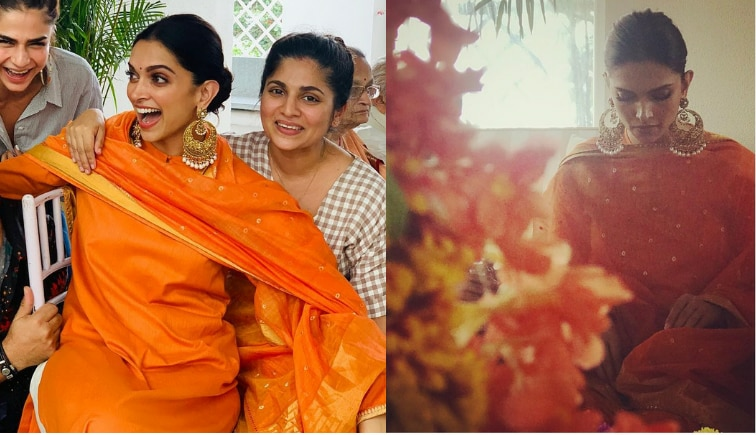 Pre-wedding Puja: For a pre-wedding puja, Deepika chose kept it simple in an orange suit and chandbalis by Sabyasachi. 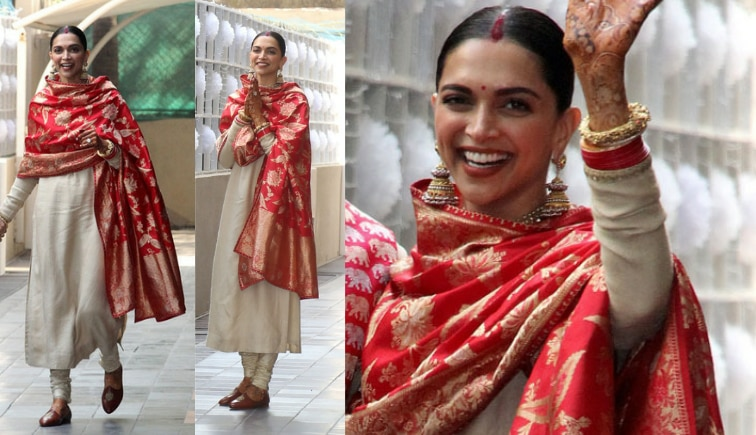 Mehendi: For her Mehendi, Deepika chose a blush pink kurta paired with a red shawl. Layered jewellery and simple makeup finished out the actor’s look. 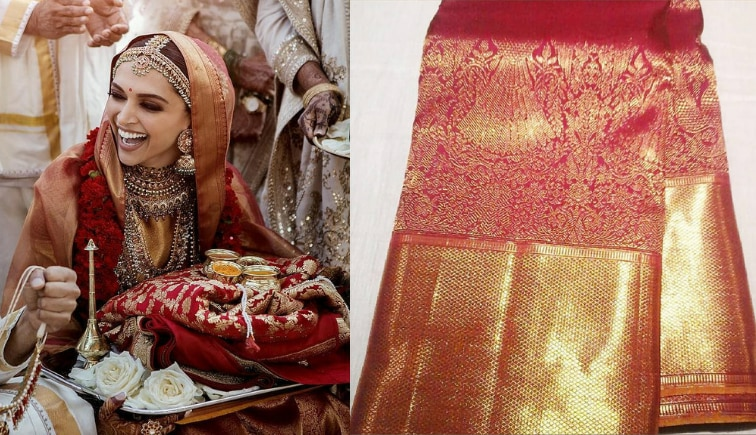 Konkani Wedding: For her wedding, Deepika went the traditional route in a red Kanjivaram sari by Bangalore based Angadi Galleria. Her temple jewellery comprised of a mathapatti,statement necklace and a stack of bangles all by Sabyasachi. 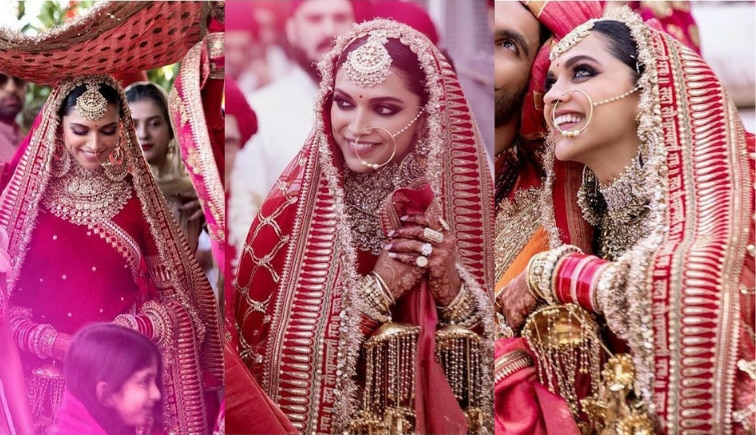 Sindhi Wedding: For her Sindhi wedding, Deepika went for a classic red lehenga by Sabyasachi. What grabbed our attention the most was the veil which had incantation ‘Sada Saubhagyavati Bhava’ (which roughly means ‘my you always stay married’) embroidered on the border. Her jewellery comprised of big maang tikka, oversized nose ring, multiple rings and the traditional chooda and kalire. At the airport: While on their way back to Mumbai from Italy, Deepika chose a raw silk suit featuring a red banarsi dupatta by Sabyasachi. In terms of jewellery, a pair of gold jhumkas and her traditional chuda finished out the look. 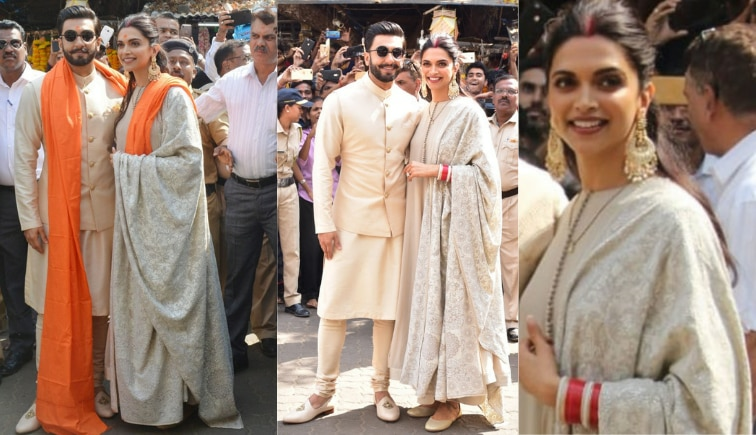 Later, while on their way to Bangalore for their reception, Deepika was seen in a whoite Sabysachi anarkali, a pair of chandbali earrings and tan juttis. 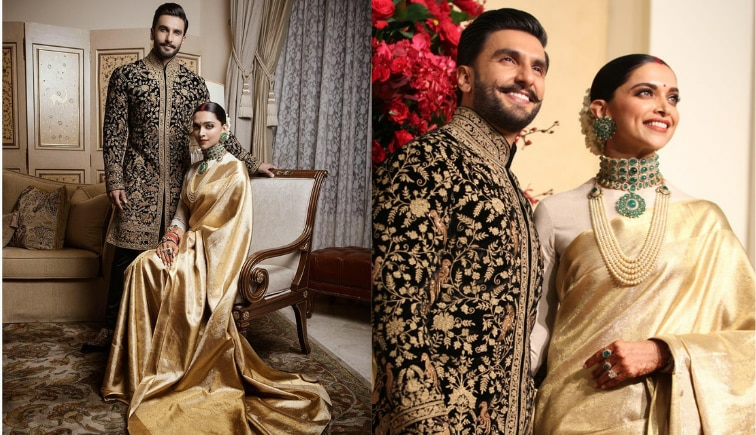 Bangaluru Reception: Deepika chose a gold brocade sari by Angadi Galleria for her Bangaluru reception. To give it a pop of colour, the actor paired her sari with an emerald choker and a long pearl necklace. At the airport: While on their way back from Bangalore, Deepika was seen in a pale pink anarkali by Sabyasachi. A pair of chaandbalis and juttis completed her look. Post Wedding Bash: For this party, Deepika wore a floral embroidered Sabysachi lehenga. In terms of jewellery, the bride chose a polka and emerald necklace. 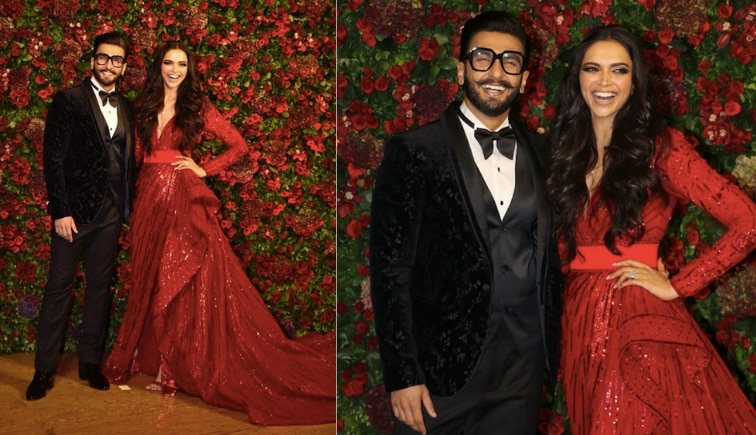 The halo of red roses and heavy smokey eyes made Ranveer describe this look as “Freida Kahlo on acid”. 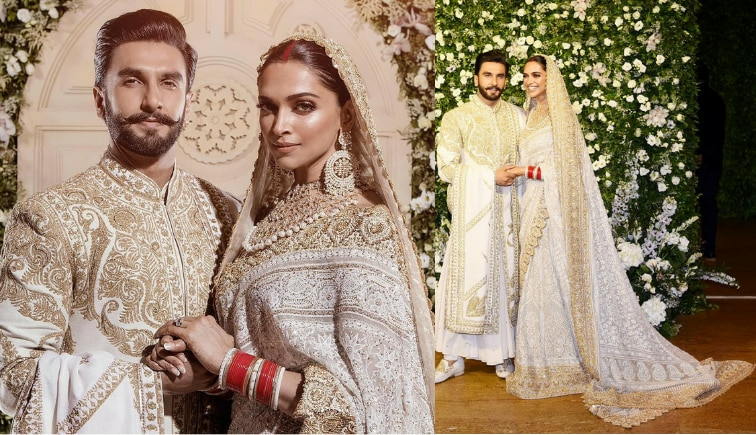 Mumbai Reception: For a reception kept for family and friends in Mumbai, Deepika went for an ivory chikankari sari by Abu Jani and Sandeep Khosla. A long veil, pearl chaandbalis, and a statement necklace added drama to the look. Temple Visit: The couple was seen visiting the Siddhivinayak Temple to seek Lord Ganesha’s wedding. 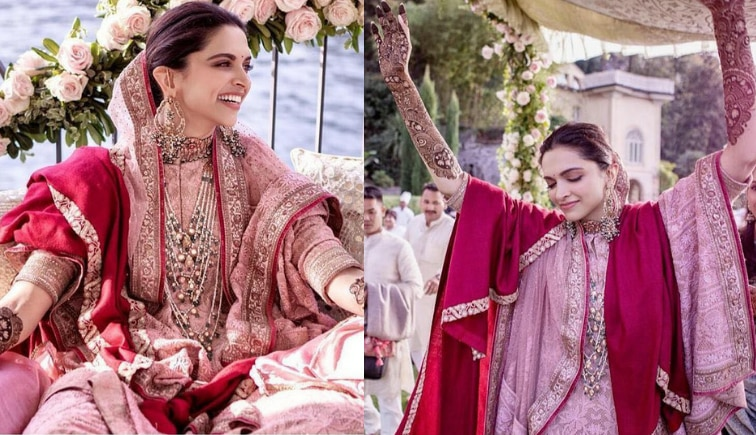 Deepika chose an ivory Sabyasachi anarkali featuring an intricately embroidered dupatta. Keeping the makeup subtle, she accessorized her look with gold chaandbalis and beige juttis. Bollywood Reception: For the party kept for their friends from the fraternity. Deepika opted for a glamorous look in a red custom made gown by Zuhair Murad. The high-low hemline and the long trail added drama to the look. Which look did you like the most? Let us know!